Earlier this week I wrote about the opportunities to get your supporter’s gifts matched by their employers. Matching gifts are new to Australia because I believe your organisation is leaving money on the table. The fact is, when I worked in healthcare fundraising I launched similar programmes which raised >$100K in the first year and grew from there. Renewal – Joe and his partner will match every dollar a donor who is lapsed (18+ months) gives. The challenge gift has become quite popular. Promotion of challenge gifts is all over my email and has been over the last week. 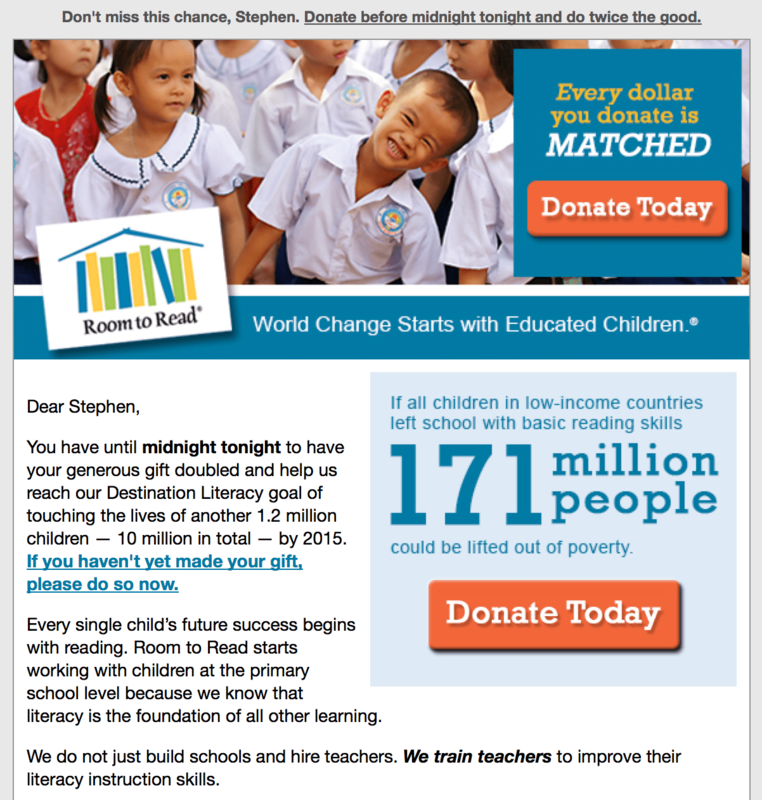 In an email on 30 Sept, Room to Read gave me until midnight that day to get my gift doubled. 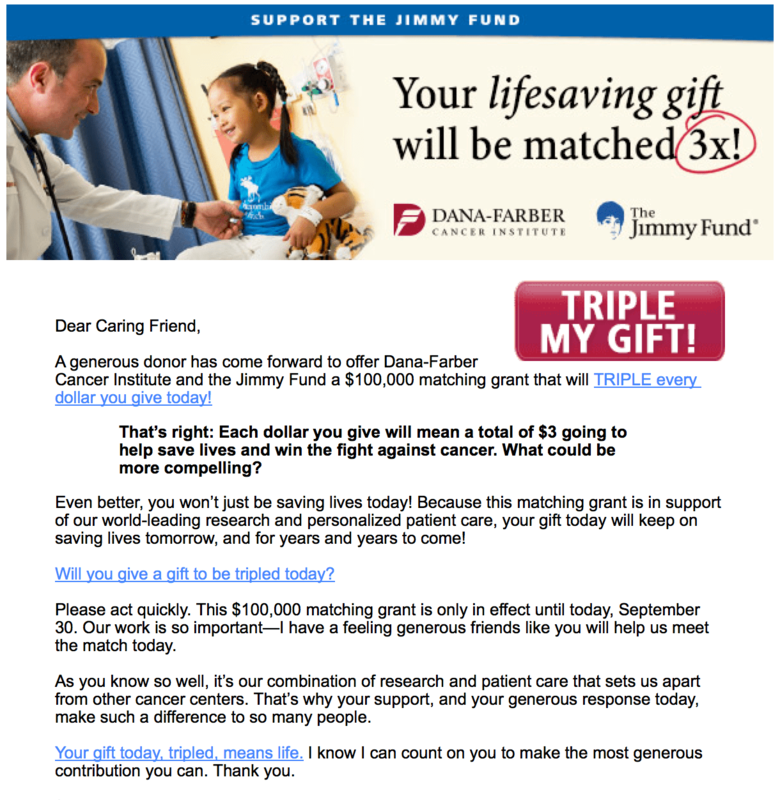 On the same day, The Jimmy Fund sent an email to tell me about a generous donor who has offered to triple my gift if I gave to their appeal that today. And, there are countless others I received over the last week asking me to give and offering me the chance to get my gift doubled or tripled all because another supporter offered a lump sum of money to the charity and challenged the charity. 1) All of the challenge emails I received were from US charities. You and I know I am on hundreds of charity lists in Australia due to the independent mystery shopping study I have conducted over the last four+ years. It is likely I would have received an email from the charities if charities in Australia are creating challenge opportunities. 2) All of the challenge emails request I respond “today” or by “midnight” to take advantage of the opportunity. The sense of immediacy, as you know, in electronic direct mail works. Create a plan for a challenge prior to asking any donor(s) for the lump sum. Find one or more generous donors to give a lump sum of money with some challenges tied to the donation. Feel like your charity does not have one donor to give the lump sum? Ask a group of donors – those on the board, those who have given a nice sized gift each year, or those who you are trying to get over the line and you need something interesting to attract them. Find people who are already engaged in the organisation and who want to make sure the money they invest will make a difference. Challenge gifts have been around for years in the US and elsewhere. There is nothing new about challenge gifts except few, if any, Australian charities are implementing the concept. Become one of the first. Take action today.